Two of our favorite Thai recipes are waterfall beef (also known as Nam Tok) and Laab (northern Thai dish), which can both be quite time-consuming to prepare. Here is a quick packet of spices that allow you to prepare either recipe quickly and easily. Very easy to make and the final result is a delicious, authentic, rich flavor. Instructions are on the package. 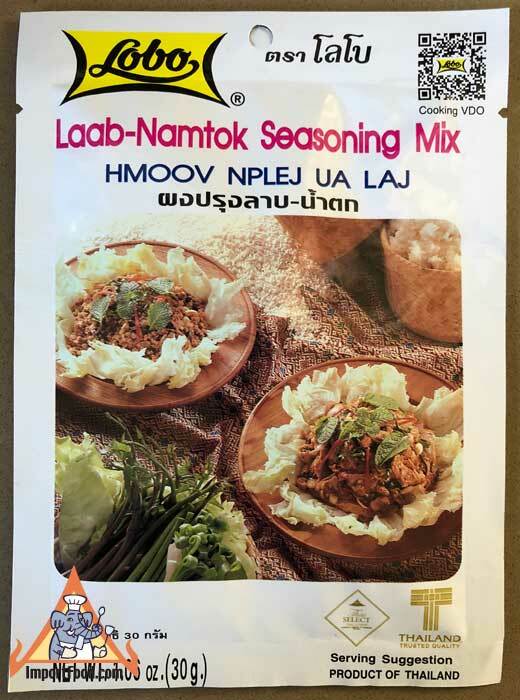 Basically just cook ground pork in a pan, add water then add the package of Lobo laab-namtok. Garnish with cucumber, shallot, mint leaves and spring onion. Serve with Thai sticky rice. Ingredients: roasted rice, chile powder, citric acid, msg, salt, shallot, garlic powder, spices. Product of Thailand. We also have namtok instant noodles.